Could Philippians 4:3 refer to Paul's wife? The word σύζυγε is rendered as "companion" or a synonym by almost all modern translations (a few take it as a name). However, Origen, who I believe was a native speaker of Greek took it to mean "wife". 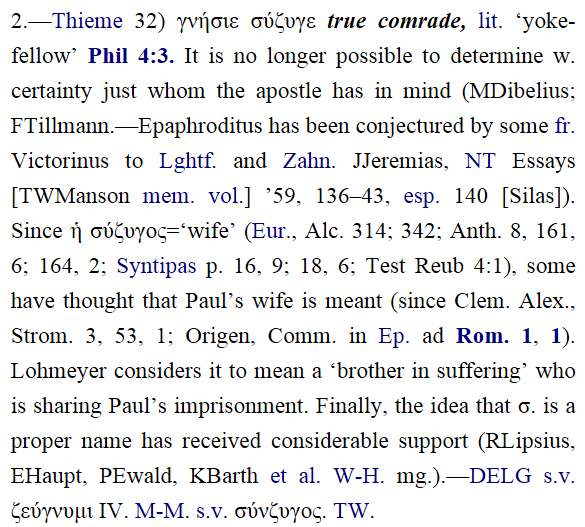 Clement of Alexandria also talks about Paul having a wife, and BDAG suggests he is thinking of Phil 4:3. But as Susan points out, others feel Clement was referring to 1 Corinthians 9. Assuming σύζυγε is a common noun (technically an adjective), how plausible is Origen's interpretation grammatically? I know Paul more-or-less says he is single in 1 Corinthians 7:7, and argues that being single is the superior state, which obviously counts against interpreting Philippians 4:3 as referring to a wife. But, it does not completely rule out that Paul was married by the time he wrote Philippians 3-5 years later. Thus, I would prefer an answer based primarily on the grammar and immediate context. The Greek word σύζυγε is declined in vocative case, either the feminine or masculine gender, and singular number, from the lemma σύζυγος, an adjective functioning substantively in this particular context. 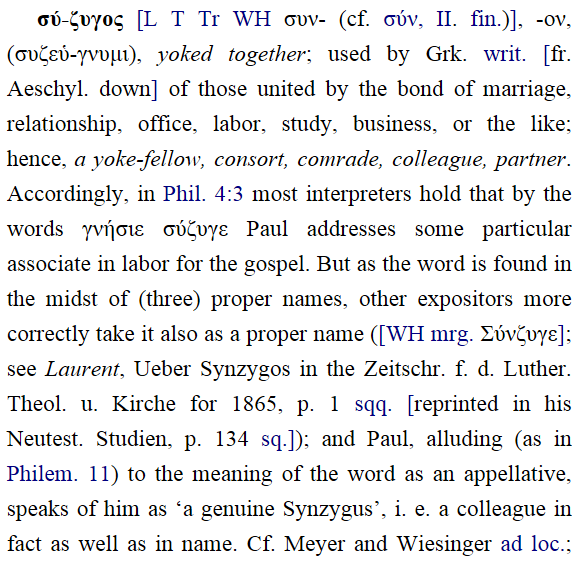 The adjective σύζυγος is related to the verb συζεύγνυμι, which means “to be yoked together.” This verb occurs twice in the Greek New Testament, and in both instances, it refers to being married. 6 so that they are no longer two, but one flesh. Therefore, what God has yoked together, let no man separate! As for the claim that the apostle Paul is referring to someone’s name, I hesitate to accept this claim since he modifies σύζυγε by the adjective γνήσιε, which he does nowhere else before a name.6 On the other hand, he does modify names by other adjectives elsewhere,7 which therefore leaves the possibility. By itself, it cannot be determined whether σύζυγε is referring to a male or female, since it could be declined in the masculine or feminine gender. However, because it is modified by the adjective γνήσιε, which is certainly declined in the masculine gender alone,8 then σύζυγε must also be declined in the masculine gender in agreement with the adjective γνήσιε. If the apostle Paul would have modified σύζυγε by γνησία, which is declined in the feminine gender (whether vocative or nominative), then there would have been a basis for the assertion that σύζυγε is referring to a wife. In summary, σύζυγε by itself can mean “wife,” or even “husband.” Only an associated adjective or the definite article when the word is not declined in the vocative case could clue the reader in on whether it’s referring to a male or female! However, because the apostle Paul modifies σύζυγε by the masculine-gender adjective γνήσιε, the word σύζυγε in Phil. 4:13 is understood to be declined in the masculine gender and could not therefore be interpreted as referring to the apostle Paul’s wife. It could however be a proper name, but ultimately, the matter remains unsettled. Arndt, William; Bauer, Walter; Danker, Frederick William. A Greek-English Lexicon of the New Testament and Other Early Christian Literature. 3rd ed. Chicago: U of Chicago P, 2000. Liddell, Henry George; Scott, Robert; et al. A Greek-English Lexicon. 9th ed. Oxford: Clarendon, 1940. Meyer, Heinrich August Wilhelm. Critical and Exegetical Handbook to the Epistles to the Philippians and Colossians, and to Philemon. Trans. Moore, John C. Ed. Dickson, William P. New York: Funk, 1889. Wilke, Christian Gottlob. A Greek-English Lexicon of the New Testament: Being Grimm Wilke’s Clavis Novi Testamenti. Trans. Thayer, Joseph Henry. Ed. Grimm, Carl Ludwig Wilibald. Rev. ed. New York: American Book, 1889. 7 e.g., “the beloved Persida” (Περσίδα τὴν ἀγαπητήν; cp. Rom. 16:12); “the beloved Apphia” (Ἀπφίᾳ τῇ ἀγαπητῇ; Phlm. 1:2); etc. 8 The corresponding feminine declension would be γνησία. 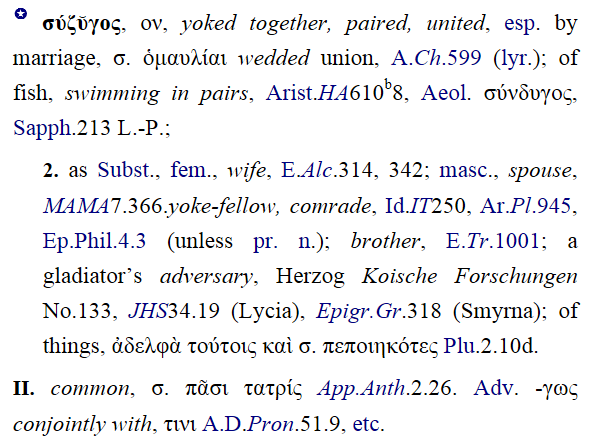 It is correct to say that σύζυγος (literally “yoke-mate, one of a pair”) can be masculine or feminine, and that it is very often used to mean “wife” in classical and post-classical Greek. But in this passage it is modified by the adjective γνήσιε, which is unmistakeably masculine singular vocative. Thus, “wife” is not possible here. Anyway, as you point out, in 1 Cor. 7:8 Paul does say very clearly that he is not married, and that he considers it better for all to remain unmarried “like me”. Are we to believe that Paul changed his attitude towards marriage between writing 1 Cor. and Phil.? Now to the unmarried and the widows I say that it is good for them to remain [as such], [just] as myself. If, however, they cannot control themselves they ought [indeed] to marry; for it is better to marry than to burn*. Are we to entertain that St. Paul either went against his own advice, or couldn't control his passions? * with passion? in Hell? Not the answer you're looking for? Browse other questions tagged greek word-study philippians hapax-legomenon patristics or ask your own question. Who is the “True Companion” in Philippians 4:3? What evidence is there that “morphe theou” in Philippians 2:6 means “God's nature”? What do the words “fear and trembling” in Philippians 2 refer to? Philippians 2:12 - How should “Work Out” be interpreted? What is the meaning of “katatomē” in Philippians 3:2? What does the Greek word μεριμνᾶτε mean in Philippians 4:6? What does the word harpagmos mean in Philippians 2:6? In Philippians 2:10, to what or whom does the Greek word καταχθονίων refer? In Philippians 1:13, to which “palace” does the apostle Paul refer? Is the 16th & 17th verse transposed in Philippians 1?